Etherton Farms is located in Larimore, North Dakota. It is in the Northeastern part of the state. We are a small breeder specializing in halter bred horses. TESIGN (Deceased) was a 1992, 15'2" hand sorrel stallion. HYPP N/N. He was an own son of Design By Money. 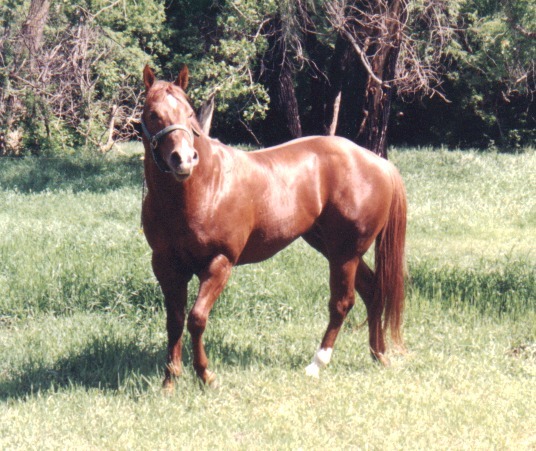 Te was the 1994 winner of the North Dakota Quarter Horse Association Futurity - 2 year old stallions - amateur and open and was also the North Dakota high point two year old stallion. He proved himself to be a sire from every foal crop. Take a look at what he produced under the link - Tesign's Offspring. Good Time N Fella is a 2005 Palomino son of Mr Yella Fella out of a daughter of Playgirls Conclusion. 16 hands. HYPP N/H. He has 183 PHBA open halter points & 22 PHBA color points, with 19 Grands and 8 Reserves in Class A shows and 8 Grands and 2 Reserves in Class B shows, he also has his Open PHBA ROM. He also has 137 PHBA Amateur halter points, his Amateur PHBA ROM, Superior ROM and 17 Amateur color points. He was 2006 High Point PHBA Open Halter Stallion and 2006 High point Amateur Stallion. In 2007 he was top 5 (tied for 3rd) at the PHBA World Show. 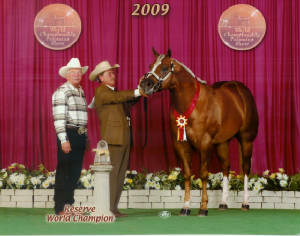 2007 Circuit Award - Dixie National Palomino Show, 2 Year Old Stallion. Thank you Joe Trosclair from Covington LA for doing such a great job with GT! 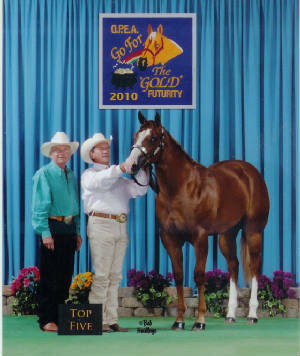 GT is the sire of the reserve "Get of Gold Junior Weanling Mares (All Colors) **Open** at the 2009 Go For The Gold Futurity - Good Time N Josie - and - FLASH Josie was 3rd at the 2010 Go For The Gold Yearling Mares (All Colors) proudly owned by Garrie & Anne Etherton - Another BIG thanks to Joe Trosclair for doing a great job with Josie for us - Check out Joe & Dana's website: http://www.elviswhitediamond.com/ . Congratulations also goes out to Nancy Newell & Calvin Sims, Ellisville, MS, on the purchase of Good Time N Memory. 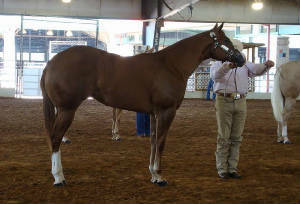 MS Congress Winner in open and amateur - yearling geldings. Going grand in both AQHA & PHBA. 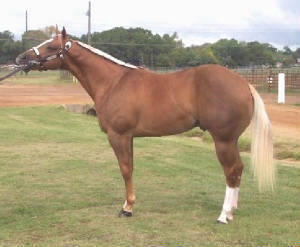 Take a look at this fine gelding under sold horses on the navagation bar! 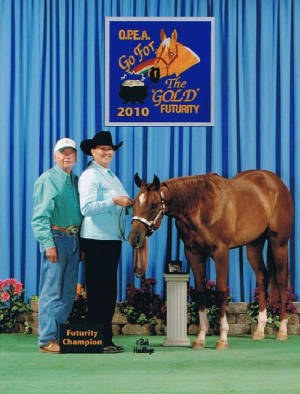 We need to congratulate another GT foal - Passe Good Time - another 2009 filly showed at the 2010 Go For The Gold - owned by Sue Reeve, Bush, LA on winning the Go For The Gold Yearling Amateur Longe Line Jackpot (all Colors)! CONGRATULATIONS TO DON PATTERSON, AND TRULEY A GOOD TIME. LEROY WON 2011 MSSA FUTURITY, AND 2012 NDQHA YEARLING GELDING FUTURITY, 2ND IN LONGLINE, 2 GRANDS & 1 RESERVE IN OPEN GELDINGS! LOOK N GOOD WINS THE 2012 MSSA WEANLING FILLIES & RRVSS FUTURITY. CONGRATULATIONS TO GARY HERSOM, IOWA & MELLOW YELLOW FELLOW - 2ND & 3RD IN THE NATION IN STOCK TYPE HALTER, GELDINGS THREE YEARS IN A ROW! CONGRATULATIONS TO HIS NEW OWNER! 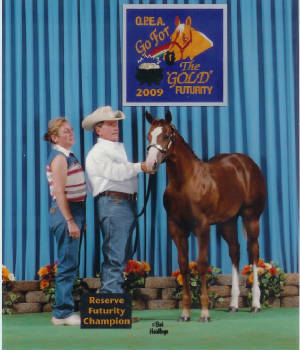 2010 Go For The Gold Futurity Champion! Above: Bred by Chip Knost - this royally bred stallion stood at Etherton Farms. He was a one of a kind stallion that is truly missed every day. This picture was taken while out having some fun in the pasture! If you're ever in the area and want to stop by give us a call, the coffee's always on. Always fun to visit and talk horses.